The trails of the idea to make Milan accessible from the see are lost in the chronicles of times that date before the times of the design and construction of the first artificial navigable canal. Since the antique times many of the water courses that encircled the city had deviations to take the water straight to the city but none of the rivers or torrents were of the sufficiently big to become what the city desperately needed. The Navigli of Milan are the artificial canals constructed between 1179 (Naviglio Grande) and the 16th century (Naviglio Martesana) with the purpose of making Milan accessible from Ticino and Adda. The Navigli were a passing route not only for the merchandise on its’ way to Milan but also for the marble of Candoglia used for the construction of the Milan’s Cathedral and, in more recent times, a transporting route for the rolls of paper used by the typewriters of Corriere della Sera. 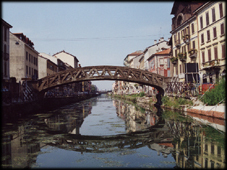 The construction of the Naviglio Grande begun in 1179 and in 1209 the Naviglio arrived to Milan. Since the first day of the construction the best engineers undertook the project and even today it is possible to admire the innovative system of dams conceived by Leonardo da Vinci at the end of 15th Century. It took only 35 years, from 1439 to 1475, to build 90 kilometres of canals on the Milan territory made navigable thanks to the existence of 25 valleys, a characteristic no other city has. The development of the system didn’t stop at this point. On the contrary, when Leonardo da Vinci begun working on the project in 1482, the Martesana was improved and he also started setting up a new system of canals that would make navigation from Valtellina to Milan possible. It was 1482 when Leonardo da Vinci, as soon as he arrived in Milan, was assigned by Ludwig II il Moro with the task to study a system that would make the navigation from Lake Como to Milan possible. 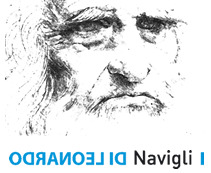 Leonardo, who already designed the system of the dams in order to solve the problem of height difference of the territory making the navigation possible didn’t miss the chance to draw some sketches that are preserved today in the Museum of Navigli. 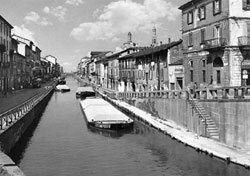 Since then the Navigli were characterized by a continuous development particulary by the construction of new canals and dams. This is how the Navigli became a fundamental means of communication for the city of Milan. In the second half of the Nineteenth Century the system of transportation by river fell into a decay because of the slowness of traveling (3 km/h) and the competitions by railways and tramcars that begun supplanting the river navigation inside and outside the city. Therefore the covering of some parts of the canals inside the city was planned but undertaken as late as 1929. Nowadays the term Navigli, in Milan, is identified with the two opened parts of Naviglio Grande and Naviglio Pavese and in more general sense the area in between the two canals characterized by the many nightclubs.